In More Than 20 Instances, A Donor Has Given At Least $5,000 To Both The Republican And The Democrat Running For One Of Michigan’s Statewide Offices, According To Campaign Finance Disclosures. LANSING (NOV. 6, 2018) — Republican Bill Schuette and Democrat Gretchen Whitmer have disagreed on a lot of major issues this fall in their race for governor. But as it turns out, they share more than a few common campaign donors. At least 23 individuals or groups have apparently contributed $5,000 or more to both Schuette, the attorney general from Midland, and Whitmer, the former Senate minority leader from East Lansing. And the governor’s race isn’t the only one where donors have reached across party lines. In the race for secretary of state, at least two donors have given more than $5,000 to both major party candidates, and one political action committee (PAC) made large contributions to both major party candidates in the race for attorney general. Many of the donors who supported competing candidates are well-known business leaders or interest groups that want to have a positive relationship with whichever candidate wins on Election Day. In the race for governor, for instance, the PACs of the Auto Dealers of Michigan, the Michigan Beer and Wine Wholesalers Association and the Michigan Realtors have financially supported both Schuette and Whitmer. All three PACs represent statewide organization and are among the most active PACs in the state. According to campaign finance disclosures, the Auto Dealers of Michigan, the 37th largest PAC in the state, has given $56,500 to Schuette’s campaign while giving $5,000 to Whitmer’s campaign. The Michigan Beer & Wine Wholesalers Association PAC is the 22nd largest PAC in the state. It’s given $67,750 to Schuette’s campaign and $31,000 to Whitmer’s campaign, according to the campaign's fundraising disclosures. 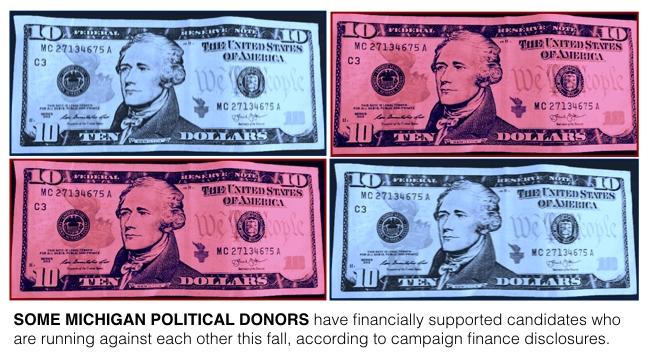 In some cases, the donors made their contributions to competing candidates on the same day. The Michigan Realtors PAC, the 13th largest PAC in the state, is an example of this phenomenon. Its PAC gave $68,000 — the maximum a PAC can give to a candidate — to Schuette’s campaign on June 14, 2018, and $20,000 to Whitmer’s campaign on that same day. The Auto Dealers of Michigan did the same thing in the race for secretary of state. It’s the secretary of state who licenses and regulates vehicle dealers in Michigan. On Sept. 24, 2018, the PAC reported giving $10,000 to Jocelyn Benson, the Democratic candidate for secretary of state, and $10,000 to Mary Treder Lang, the Republican candidate for secretary of state. Similarly, the PAC of the law firm Miller Canfield has supported both candidates in the race to be Michigan’s top law enforcement officer. During the month of September 2018, Miller Canfield’s PAC reported giving $9,300 to Republican Tom Leonard’s campaign at fundraisers. Then, on Oct. 2, 2018, the PAC reported giving $10,000 to Nessel’s campaign. A handful of the shared donors in the race for governor are focused on the health care industry. The PAC of the state’s largest health insurer, Blue Cross Blue Shield, has given $68,000 to Whitmer’s campaign for governor and $42,500 to Schuette’s campaign. Executives with Meridian, the Medicaid health plan, have also contributed to both campaigns. Jon Cotton, Meridian’s president, and David Cotton, Meridian’s CEO, have each given $6,800 to both Whitmer and Schuette, according to disclosures. That amount is the maximum an individual can contribute directly to a candidate for governor. The following is a list of the apparent shared donors of at least $5,000 that the Michigan Campaign Finance Network could find searching through campaign finance disclosures from the candidates for governor, attorney general and secretary of state. It’s possible that some of the money could have been transferred to the campaigns from a past candidate committee. Regardless, it’s now being used by the new campaign. — Miller Canfield PAC gave $10,000 to Nessel’s campaign and $20,300 to Leonard’s campaign. — Peter Karmanos, a businessman from Orchard Lake, gave $6,800 to Benson’s campaign and $6,800 to Treder Lang’s campaign. — Michael Yaldoo, of Quicken Loans, gave $6,800 to Whitmer’s campaign and $5,000 to Schuette’s campaign. ARTICLE $75 Million Thrown Into Michigan Governor’s Race. Here’s Who’s Spending.